Living and working productively with stress. Learn how to deal efficiently with stress. The persolog Stress Model will help you to analyze your stress dose as well as your behavior under stress. You will identify your stress potential and learn how to prevent negative stress. › Strengthen. Reflect about your personal stressors. › Stress. Optimize your stress-related attitude. › Resistance. Learn how to deal with stress. The reaction to stress is as individual as human beings. Therefore, the persolog Stress Model combines the analysis of stressors with the analysis of individual stress-related behavior. On this basis you will develop a way to deal adequately with stress. Learn to turn negative, counter-productive stress into positive productive stress. 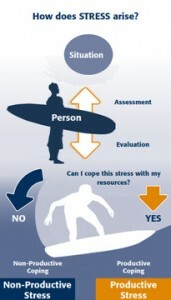 Do not only identify your stressors. Learn also to understand your stress-related behavior, develop stress competence and make use of stress as a driving force. In contrast to other models the persolog Stress Model does not only offer a company-wide stress analysis. Individual and often diverging points of view of the same stressor are also taken into consideration. With the persolog Stress Model you do not merely fight against stress symptoms. You can determine their individual causes and develop a long-term management strategy for everyday life. Discover a variety of application scopes. Apart from the work-related stress our model also focuses on private stressors. Therefore, it can be applied in organizational health management, for private stress analysis, in trainings and individual measures. It can also be integrated into existing concepts. The persolog Stress Model is based on the behavioral research by Prof. John G. Geier and goes back to recent stress research, such as by Lazarus, Kaluza and Fromm. On this basis Dr. phil. Lana Ott and Renate Wittmann ((MA/education) developed a pragmatic learning tool. Get to know the persolog Stress Model in the persolog Academy. For certifications in English, please contact us!